A mass of spring flowers, including daffodils, narcissi and primulas, surrounded by a pretty green and cream border. The colours are soft and fresh. 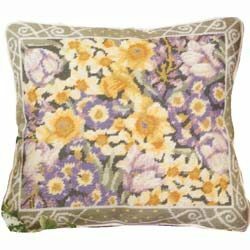 The kit uses Anchor tapestry wool on 12hpi canvas and measures 15" x 13" (38 x 33cm) suitable for a cushion or pillow.